Owner Waleed Zarou’s daughter Juliana Zarou, the original throw dough girl, is now a little older, but still has the knack for throwing dough and has been invited to join the U.S. Pizza Team. Her arrival is just in time to be able to participate in one of the most cherished annual events in America, the Macy’s Day Parade. For those unfamiliar with what throw dough is all about, we’ve listed a clip of a previous performance so you can see some of these skills in action. Juliana was the first girl to compete in the throw dough competition and now will be able to support the U.S. Pizza team in one of the grandest performing stages in the land. Oxford, Miss. (2010) – Members of the United States Pizza team will march and perform dough acrobatics as part of the 84th annual Macy’s Thanksgiving Day Parade. The Macy’s Parade steps off on Thursday, November 25, 2010 at 9:00 a.m. and can be seen nationwide on NBC-TV. The team, which was started in 2000 and is sponsored by pizza industry vendors and PMQ Pizza Magazine, is composed of pizzaiolos from around the nation whose skills range from baking to dough stretching to individual and group dough acrobatics. While team members often use real dough in competition, members will spin Throw Dough (throwdough.com), a synthetic, practice dough used for performing elaborate tricks during the parade. In publication for 13 years, PMQ Pizza Magazine (www.pmq.com) reaches 40,000 owner/operators of America’s 76,000 pizzerias. In the 36 billion dollar pizza industry, PMQ is a business monthly with a website which hosts 5,000 Web visitors each day at PMQ.com and 10,000 newsletter subscribers each week. PMQ Pizza Magazine also has publications in China and Australia. With more than 50 million viewers across the country and more than 3.5 million spectators that line up along the streets of New York City each year, the Macy’s Thanksgiving Day Parade is a national icon that has grown into a world-famous holiday event. For more than 80 years, the Macy’s Thanksgiving Day Parade has marked the official start of the holiday season. Growing in size and scale, the Parade proudly marches down a more than 2-mile route in New York City with more than 8,000 participants in tow including Macy’s employees, their families, celebrities, athletes, clowns and dance groups spreading holiday cheer. The Parade also features America’s best marching bands, fabulous floats and Macy’s signature giant helium character balloons. For more information on the Macy’s Parade please visit www.macysparade.com or call the Parade hotline at (212) 494-4495. The Dons’ would like to help you cheer for your favorite NFL team this season! For gamedays only (Sunday, Monday, Thursday), we’ll give you a free 2 liter soda to enjoy with any Famiglia size pizza order for pick-up or curb-side service. Just mention NFL Offer when you place your order. *Not valid with any offer. 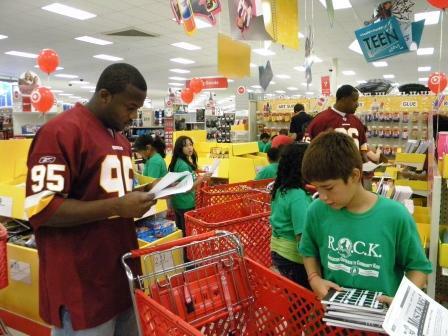 The Dons was able to feed all 60 kids from the different non-profit groups who each got 100 credit to shop with a Redskins for their school supplies. Please visit the July 20th Redskin blog for more coverage and photos. It wasn’t first place but The Dons’ Pizza finished in the top 10 list for best pizza in the D.C. area according to a fan poll run by WTOP radio’s website. We think a lot of the voters haven’t ventured far enough outside of the city to experience us yet to know the difference, so we invite you to come visit us out in Sterling, VA! WASHINGTON – One thing is universal: The topic of pizza brings out a wide variety of opinions. That’s why WTOP received nearly 250 different nominations for “best pizza” places in the D.C. area. WTOP has narrowed the nominations down to a Top 10, and we want you to vote. The list features some of the tried and true pizza purveyors in the region, as well as some dough-rolling rookies. Please place your vote by visiting the WTOP website (vote by using Today’s Poll on the right). You may also place your comments as well. Voting will be open until Thursday at noon. A winner will be announced Friday. 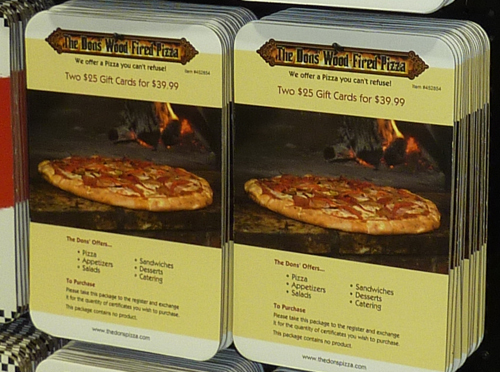 The Dons’ Pizza is now offering gift card packages at the Sterling Costco location. The offer is $39.99 for two $25.00 gift cards. Redeem offer card at the register, where they will exchange it for an envelope containing the two gift cards. 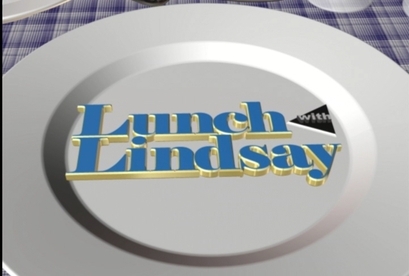 The Loudoun Times is looking for feedback on the best pizza in Loudoun county. 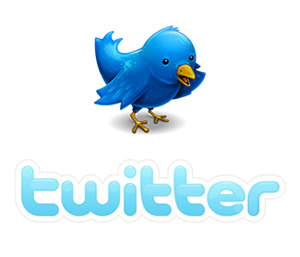 The Dons’ is now on Twitter! Follow the latest Tweets from TheDonsPizza Twitter Account. We’ll post site updates, promos, news, etc. PLEASE NOTE, The Dons no longer uses Still Riding, but has switched to Glutine Senza crusts. Please visit our gluten free pizza description for more information. The Dons’ Wood-Fired Pizza is now working with Still Riding Pizza to offer a brick oven gluten-free pizza. Here is the official information from Still Riding Pizza. You are on a gluten or wheat free diet and you feel great, but let’s be honest, how much do you miss being able to eat real pizza from a pizza parlor? Maybe it’s the fun and convenience you miss. Maybe you’ve felt left out at birthday parties, sleepovers and movie nights too. Well, your pizza problems are over. We have developed a delicious, authentic, New York style, par-baked crust that is entirely gluten free. 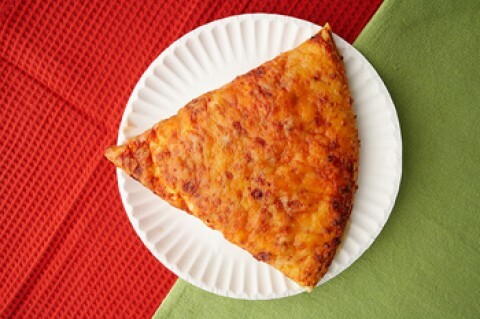 When we partner with your local restaurant or pizzeria, the result is a delicious and safe solution for Celiacs and others who avoid wheat and gluten, but still want to eat real pizza. We educate the restaurant how to do this safely and successfully. We have a proven method and set-up and can train anyone who is willing. Our product is made in a 100% Gluten Free facility built by us and used only for this purpose. This takes the risk of preparation out of the hands of the restaurant. Much of the marketing of this product is done in non-traditional channels, and we have a proven program that works. We are part of the gluten-free community, and know who they are and what they want.